Lucky Nugget offers very attractive promotions. First, there is a Loyalty program so players get awarded along the way with points they can redeem. There are also free no-deposit spins. Lastly, Lucky Nugget offers a first deposit bonus of 150% up to $200 and a high roller bonus of 100% for deposits of up to $1000. The Lucky Nugget Casino website has so many gaming options. Gamblers who like slots, craps, keno, bingo, roulette, blackjack and scratch cards are all covered. Some of the biggest names from Lucky Nugget are; 5 Reel Drive, 108 Heroes, Alaskan Fishing, Amazing Aztecs, etc. The casino also offers progressive jackpots for big money. Lucky Nugget Casino works with two of the best casino software providers; Microgaming and Evolution Gaming. This duo is renowned for developing the best casino gaming software that run on the best Random Number Generator (RNG) systems. The games are responsive and use the latest technologies including HTML5 among others. To get started, deposit money to the account using any of the listed eWallets and credit/debit cards; PayPal, Neteller, Maestro, Visa, EntroPay, Skrill, iDEAL e.t.c and take 0-2 hours. There is also the option of bank transfer. The minimum deposit allowed on Lucky Nugget Casino is $10 or the equivalent. As for withdrawals, eWallets withdrawals are supported and take the least time; between 24 and 48 hours. Withdrawals can also be made to credit and debit cards in 2 – 6 days while bank transfers and cheques take 3 – 7 days and 5 – 21 days respectively. The weekly withdrawal limit is $4000. Over the years, Lucky Nugget has been improving their platforms and today, players all over the world can choose their preferred language instead of following a foreign language blindly. The website has been translated to several international languages, for example, English, German, Spanish, Italian, Swedish, Russian, and Portuguese just to mention a few. The platforms also support a variety of currencies so that players don't hassle for conversions on the calculator or Forex websites and applications. Lucky Nugget allows players to choose from the included currencies; US dollar, Canadian dollar, Australian dollar, Swiss Francs, British pound, euros, and Yuans among other global currencies. 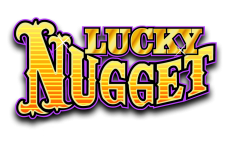 Lucky Nugget Casino is available as instant play and supports mobile gaming as well. The graphics, sound, and game fluidity is excellent. The casino is available for all devices with Windows OS, iOS, Android and Mac OS. All the user data on the casino's website is safe courtesy of 128-bit SSL encryption. When it comes to customer service, Lucky Nugget is again outstanding. There is a 24/7 live chat support for immediate feedback. Additionally, the casino has several telephone lines for the top countries including Germany, Switzerland, Canada, Italy, and France among others. An international line is provided as well together with email.